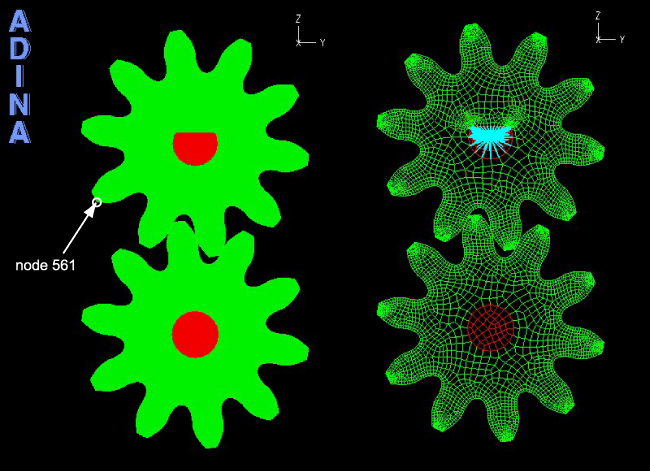 In a previous Brief, we presented a problem involving fluid-structure interactions in which, when the Newmark method was used, contact chatter in the structural response as well as unphysical pressures in the fluid were seen. In this Brief, we present two additional problems and assess the merits of using two time integration techniques in solving these classes of problems. In the first problem solution, provided by MGI COUTIER, the dynamic response of a gear system was studied. Figure 1 shows the schematic of the problem. The top gear was driven at a constant angular velocity of 2000 rad/s and the bottom gear was driven by the top gear due to the contact between the gear teeth. 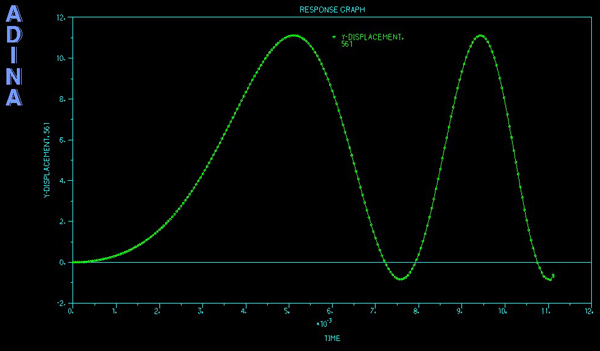 The objective was to compute the response of the system for 0.5 s using a time step size of 5 x 10-5 s.
Two different implicit integration schemes were considered: The Newmark method with = 0.25 and δ = 0.5 (the widely-used trapezoidal rule) and the Bathe method, available in ADINA . The contact between the gear teeth was assumed to be hard contact (no compliance was used) and the contact surfaces were assumed to be frictionless. The large displacement formulation was used to account for the large rotations of the gears. No physical damping was introduced in the model. The movie at the top shows the displacements of the gears computed using the Bathe method (of course the response is slowed down for visual purposes). The time history of y-displacement at node 561, highlighted in Figure 1, is presented in Figure 2. The Newmark method diverges after 222 time steps while the Bathe method completes the 10,000 time steps. Here we only present the results for the initial part of the response for which data is available for both methods. The time histories of the y-displacement in both methods are very similar, except towards the end where the Newmark method shows numerical noises and diverges while the Bathe method continues without any difficulties. 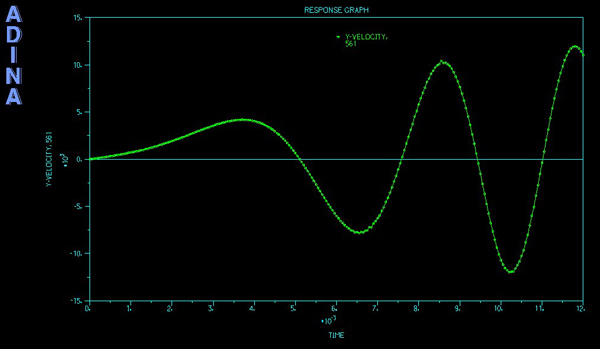 Figures 3 and 4 depict the y-velocity and y-acceleration time histories at node 561, calculated using the two methods. 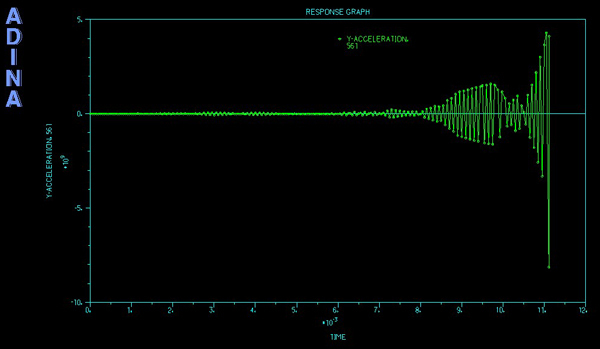 As seen, over time, error builds up in the velocity and acceleration when using the Newmark method and this error eventually becomes very large. This is the main reason why the solution using the Newmark method diverges in this problem. The error in the velocity and acceleration of the gears causes unphysically large impact forces between the gear teeth every time they come into contact. As a result, the elements in the contact region undergo severe unphysical deformations and even collapse. 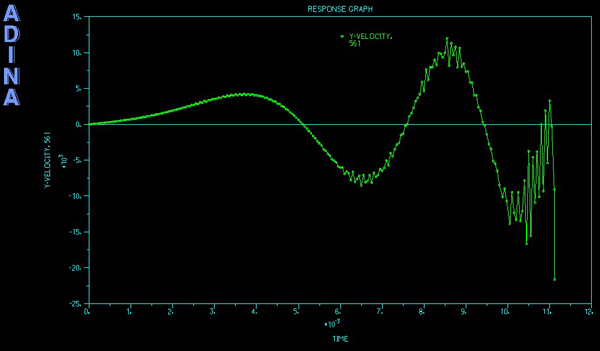 In Figure 3, large numerical noises using the Newmark method and the final overshoot of the velocity are worth noting. 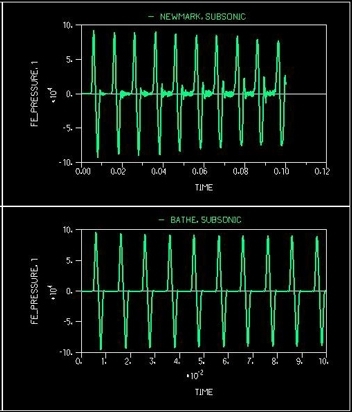 In Figure 4, the highly oscillatory accelerations in the Newmark method and also the fact that the accelerations are two orders of magnitude larger than when using the Bathe method are noteworthy. The second problem solution, provided by Onsala Ingenjörsbyrå, involves a wave propagation in an acoustic medium. Figure 5 depicts the schematic of the model. A long duct with rigid walls was filled with liquid and was subjected to a sudden fluid flux at one end. The problem was solved using both the Newmark method (trapezoidal rule) and the Bathe method. The fluid was assumed to be a nonlinear acoustic fluid (using the subsonic potential based fluid formulation in ADINA). 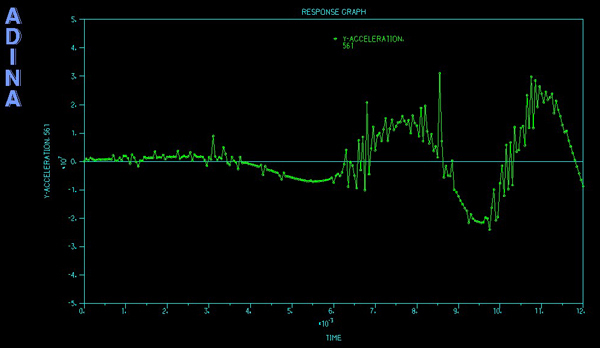 The fluid was represented by 3D 8-node potential based elements and the response was calculated for a duration of 0.1 s using 1000 time steps. Due to the geometry and boundary conditions, this is effectively a 1D wave propagation problem. Since the acoustic medium has no source of energy dissipation and the boundaries are rigid, we would expect to see a pattern of pressure similar to the input to be repeated in time as the waves repeatedly reflect from the end of the duct. 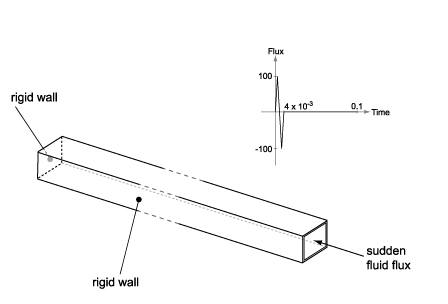 Figure 6 shows the time histories of pressure at the middle of the duct using both fluid models and the two time integration schemes. The movie below shows the pressure contour plot using the Bathe method. It is interesting to note that using the Newmark method introduces significant numerical errors in the calculated response, whereas using the Bathe method gives good results. The examples provided in this Brief, in the previous Brief and in the reference show the merits of using the Bathe method in a wide range of problems. 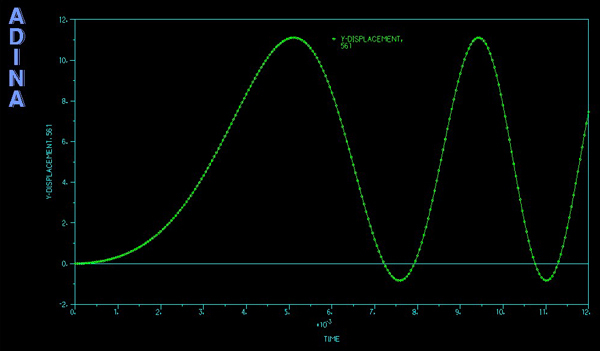 Not only does the method lead to stable and accurate solutions when the trapezoidal rule fails, actually, the method also frequently prevents convergence difficulties in nonlinear analysis when such are observed using the Newmark method.